Dr. Megaw has 35 years involvement in Mexican geology and has become well-known in the Mexican Mining industry and is a frequent speaker at international academic and technical symposia. His Ph.D. work at the University of Arizona was an exploration-focused geological/ geochemical study of the Santa Eulalia Ag-Pb-Zn District, Chihuahua and Carbonate Replacement Deposits (CRDs) in general. He has published extensively on CRDs in both geological and mineralogical journals and books. Peter’s primary exploration foci are CRDs and Epithermal Vein Deposits and Porphyry Copper Deposits. He and his team are credited with the significant discoveries at Platosa, Durango; Juanicipio-Fresnillo, Zacatecas; and Cinco de Mayo, Chihuahua. 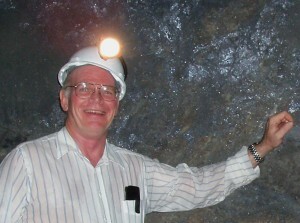 Peter was awarded the Society of Mining Engineers 2012 Robert M. Dreyer Award for excellence in Applied Economic Geology. Peter has been a passionate mineral collector since first setting foot in Santa Eulalia in 1977. He moved to Tucson in 1979 and quickly joined the Tucson Gem and Mineral Society, serving in most roles (except Treasurer) over the years. Dr. Megaw took on the job of Exhibits Chair for the Tucson Show in 1984, a job he has kept for most of the last 30 years, giving him the opportunity to visit most of the world’s major mineral museums with a special eye out for what they should bring to Tucson. His mineral collecting has come to focus almost exclusively on Minerals of Mexico. He won the Desautels Trophy in 2006 for the Best Case of Minerals at the Tucson Show for a case of Mexican Minerals. He has also three times been awarded the Romero Trophy for the best Mexican specimen on exhibit in the Tucson Show. His mineralogical writing has also been rewarded: he was the first recipient of the FM Student Paper Award in 1985 with his paper on the mineralogy of the East Camp of Santa Eulalia; in 2003 he was co-recipient with Tom Moore of FM’s Best Paper in Mineralogical Record award for their article on the Ojuela Mine, Mapimi, Durango Mexico; and he received the 2010 FM Best Paper in extraLapis award for his article on “The Geology and Genesis of (most) Collectible Smithsonite.” He has written for Mineral News since its inception and is a consulting editor and occasional author for Rocks and Minerals. He is photo-moderator for submissions on Mexico to Mindat and co-moderator of the FMF Mineral Forum, often with tongue planted firmly in cheek. He is also proud to be father to Lauren Megaw, who has blossomed into a significant collector in her own right.